This is of course based on the speed camera scandal in the UK, which is vast, and even my own investigations go back much further and expose greater and wider issues in authorities and councils in the UK and further. It goes without saying that the majority of those listed here should be considered for a range of offences such as breach of duty of care, corruption, misconduct (in public office), fraud, false accounting, perverting the course of justice, not to mention simple dishonesty, incompetence, and breach of codes of conduct, and / or aiding and abetting those offences. It is worth pointing out that it appears that these offences are even continuing today under the current regime. Pat Garrett, Dorset Road “Safe”: when the first lie was exposed, changed the lie to one of "community concern", and Dorset Road “Safe” were then completely unable to provide any relevant evidence of it and as you will see later, according to Marytn Underhill, the information about the “community concern” has now been “lost” even though I questioned it vigorously at the time!! Dorset Road Safe(? ): A further lie relating to this enforcement was stated on the FAQ section of the DRS website at the time: it stated that there was “no financial motivation to use cameras to make money as all fines (corrected from "funds") went to the government” when they were already making about £1.5 million directly through courses!! And further lies would have been told to those going on the course, about how dangerous their driving was, at less than 40 where you could virtually land a small aircraft were it not for the lampposts. They were in fact very likely to have been driving very safely. Clearly this was going to be controversial, DRS could not have introduced it without saying anything about it at all. There was no justification for it whatsoever. Dorset Road “Safe” therefore fabricated false justifications in order to make the money. The money was therefore obtained by deception. The money promoted the job prospects and security of some staff in Dorset Police / Road “Safe”, almost certainly including those mentioned above which is an abuse of entrusted power for personal gain. This is corruption and fraud. And When I put this directly to Martyn Underhill when we met, he had no defence or explanation and just tried to pass the buck to Poole Council, even though the lies came from Dorset Road “Safe” staff, headed up by the ex-chief Martin Baker, and the money went to Dorset Police. Lucianne Pharoah, FOI department, Dorset Police. This is where it all really starts. There is no possible explanation (as you will see later) other than that the course costs (which I asked for by FOI) were fabricated and vastly inflated to hide the course profits and who knows what else. There was no way out other than to try to dodge the question and that is what started here and continues to this day, nearly 4 years later. April 2011: LP dodged, delayed, obstructed and ignored the original Freedom of Information request . The IPCC eventually forced them to respond, and they did, although only providing the absurd and vastly inflated top level costs, (i.e. MISREPRESENTED) which have STILL not been explained. Mike Glanville, Assistant Chief Constable: In response to my FOI request to explain the top level figures which were clearly complete fantasy in order to hide the profit , MG responded by declaring me vexatious and trying to shut down all communication with me. I later complained about MG and he “retired” very shortly after, it has since become obvious that it is common practice for police facing misconduct investigations to “retire” to avoid them!! Martin Baker, ex-chief constable of Dorset Police, who dodged my complaint against Mike Glanville, and completely ignored the totally absurd course costs, refused to engage with the issues. When the IPCC later agreed with me that MBs actions “were not within the spirit of the police reform act” and upheld my complaint, he too unexpectedly and immediately “retired”!!!! And guess what, you couldn’t make it up, Martin Baker and Mike Glanville then ended up in DIRECTORSHIP OF TWO CONSULTANCY COMPANIES THAT OFFER SERVICES TO THE NEW POLICE AND CRIME COMMISSIONERS !!! 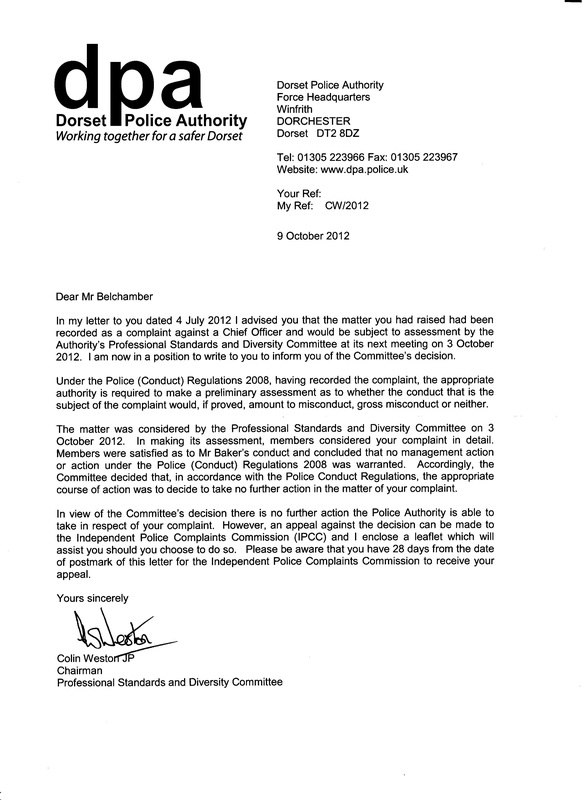 And wait until you see later how the PCC for Dorset, Martyn Underhill, then protected Martin Baker and Dorset Police!!! We are not even warming up yet. Notice that in all of these “brush offs” there is not a single reference or comment whatsoever about the actual issues, exactly as the IPCC commented was “not in the spirit of the police reform act”. These 3 are at the core of the corruption of this case as it is today. I knew policing was bad in some parts of the world but I never thought I would find it here in Dorset. As this is just a “name and shame” article I won’t repeat the detail and proof but you can see it all right here The main point is that Colin Smith, knew, believed and stated that he agreed with the 2 primary points in the IPCC investigation (you can even find the audio on my website), but then shut down communications with me, ignored these concerns and wrote that he could find "no evidence" of those failures, and then completely vanished. In other words, he too was corrupted and protected. Nicky Searle, Head of Operations including Traffic, who perhaps due to no fault of her own comes across as completely unqualified, incapable and unsuitable to do this difficult job but who also completely ignored the problems being discussed in the meeting. James Vaughan, same as above, but also conveniently “failed” to record the meeting, although, interestingly, it seemed to take him a month to “decide” it had “failed” (fortunately I recorded it), He also could not avoid confirming that one of the 4 costs was indeed misrepresented but did not follow through with the necessary corrective action about the case or explain the larger and even more absurd costs, and spectacularly dodged providing a proper response to the press release which misrepresented the reason for the £1 million fraudulent Speed on Green camera. Mark Chatterton, Chief Superintendent, Head of Professional Standards (!!!) protected him. Andy Marsh, Chief Constable Hampshire Police, was informed but did nothing. Simon Hayes, PCC Hampshire Police, was informed but did nothing. I investigated who is responsible for the PCC, and it turns out there is a “Police and Crime Panel” comprising a number of senior Dorset Councillors. I reported Martyn Underhill to them, and pointed out that at the very least, his cover up of corrupt police activities amounted to serious misconduct in public office. They referred the complaint to the IPCC!! James Dipple-Johnstone, Commissioner of the IPCC, once again ignored all the actual issues and evidence and kept the cover-up going. Jonathan Mair, “Acting Director for Corporate Resources” at Dorset Council announcing not only communications lockdown but even an appalling censorship of communication to councillors about legitimate concerns on local matters. Debbie Simpson, Chief Constable Dorset Police, also announcing a communications lockdown Debbie Simpson has therefore chosen to try to shut down exposure of serious and blatant corruption in her force by refusing to consider the facts. 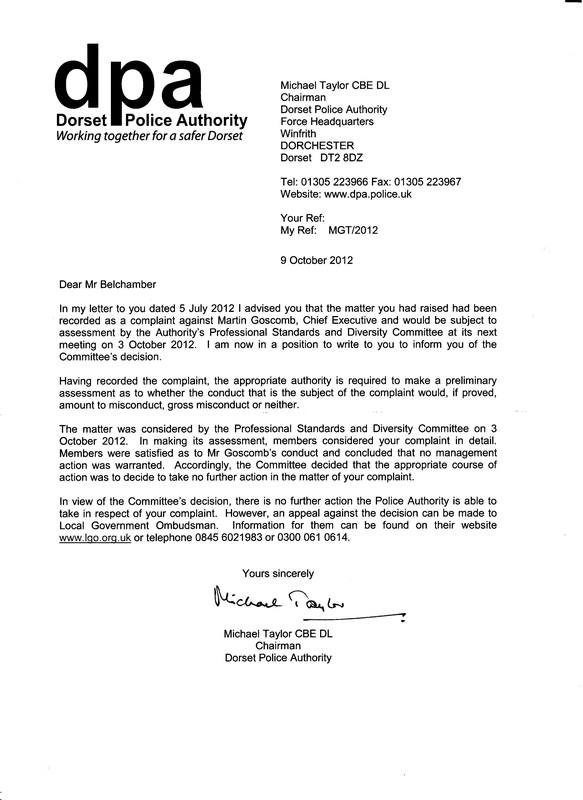 Further, the Dorset Police and Crime Panel is meant to “Scrutinize” the PCC but they have clearly instead protected him. 3. The incredible, unbelievable, shocking coverup by the information regulators. Susan Hughes, Case Officer, ICO completely ignored the comprehensive case put before the ICO and allowed the wrong decision to be reached based clearly on starting with the result that was required, the Dorset Police were all good, and working back from that. Here you can see the ICO response and my word by word total demolition of it. There was no response from anyone. I did not pursue the information investigation further. I had now demonstrated beyond all doubt that the “authorities” would fight forever and ever and fight dirty to prevent simple transparency about costs. So there we have it, at the moment, although it seems very likely this list will continue to grow. 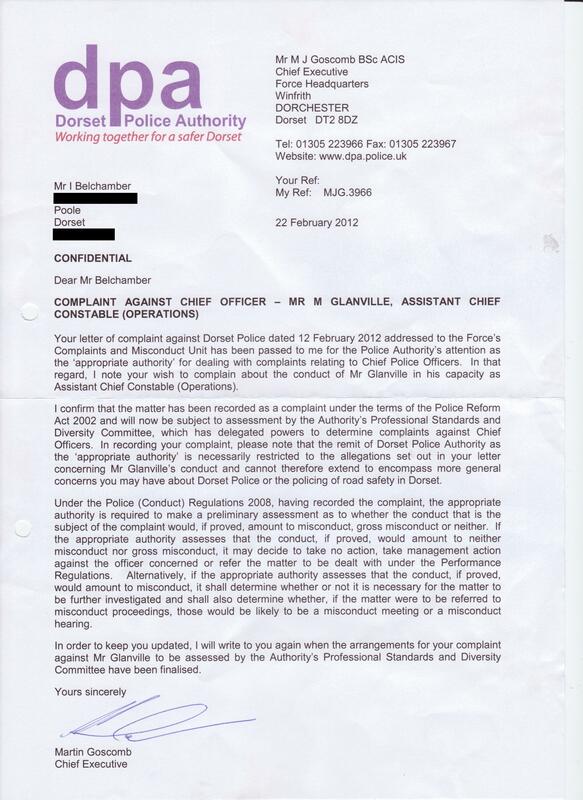 And all of this, can you believe, from a simple question asked to Dorset Police FOI on the 26th April 2011, “Could you please detail to me the COST OF PROVISION of the course (per person), and what makes this up?” Information which Dorset Road “Safe” should in any case have had prominently published to demonstrate integrity, efficiency, control, honesty, not to mention management of the obvious financial motivations of enforcement. This unbelievable saga, which has resulted from the need to prevent transparency, can only prove that my concerns are unfortunately right, and so my previous offer stands – if anyone can demonstrate to me my concerns are unfounded, I will publicly apologise, announce my total support for all the authorities I have questioned, and contribute £5000 of my own money to Dorset Charities.